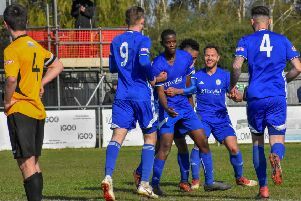 Peterborough Sports manager Chris Plummer is adamant his team have the ability and character to win an ultra-competitive United Counties Division One promotion race. Five teams have a realistic chance of going up with champions-elect Northampton Spencer and Sports are currently the best of the rest with six matches to play. But it’s a big week for Sports who are away to mid-table Bugbrooke St Michael on Saturday before travelling to one of their main rivals Rothwell Corinthians on Tuesday (March 24). “Rothwell have a few games in hand on us so it’s a game we mustn’t lose,” Plummer stated. “In fact we’ll probably need to win that game and every other one, but we are good enough and we will be strong enough mentally. Wisbech are expected to play in front of a huge crowd at their Premier Division game at AFC Rushden & Diamonds on Saturday. Wisbech are second, four points behind Diamonds, after their 13-game winning streak came to and at Peterborough Northern Star on Tuesday. Star won 2-1 thanks to goals from Jason Kilbride and James Hill-Seekings. The latter scored the winner three minutes from time. Star’s Josh Sanders and Wisbech’s Nick Bishop were sent off after a dust-up. Stamford’s Ryan Robbins has had an eventful few days. He scored in his relegation-haunted team’s 2-2 Northern Premier Division draw at Trafford last weekend before he was sent off for aiming a headbutt at the opposition manager at half-time. This week the 19-goal striker has joined up with the St Kitts & Nevis squad for World Cup qualifying matches against Turks and Caicos. Stamford have a glamour game this Saturday when league leaders FC United of Manchester visit the Zeeco Stadium.